Sugar and kerosene shall be distributed per month and other rice and wheat items on weekly basis. APL Ration Card: 9kg Rice for Rs. 8.90/kg and 2kg Wheat for Rs. 6.70/kg. APL Subsidy Ration Card: 9kg Rice for Rs. 2.00/kg and 2Kg Wheat for Rs. 6.70/kg. Both of Subsidy and Non-subsidy APL Ration Card: 2kg of wheat flour for Rs. 15.00/kg. 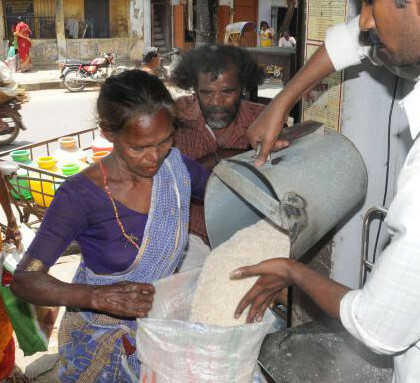 BPL Ration Card: 25kg of Rice for Rs. 1.00/kg and 5kg Wheat for Rs. 2.00/kg. AAY Ration Card: 35kg of Rice for Rs. 1.00/kg. Annapoorna Ration Card: 10kg of Rice for no cost. Both BPL and AAY Ration Card: Sugar for Rs. 13.50/kg (400gm/member). Non Electrified Household: 4 Litre Kerosene for Rs. 18.00/litre. Electrified Household: 1 Litre Kerosene for Rs. 17.00/litre. APL Ration Card: 10kg Rice for Rs. 8.90/kg and 2kg Wheat for Rs. 6.70/kg. APL Subsidy Ration Card: 10kg Rice for Rs. 2.00/kg and 2Kg Wheat for Rs. 6.70/kg. Both BPL and AAY Ration Card:Sugar for Rs. 13.50/kg (400gm/member). We are unable to know the allotment of rationing articles per member for white ration card holders (Non-Priority Non-Subsidy - NPNS Ration card (White colour). The monthly quantity and price may vary slightly depending on quota availability decided by Civil Supplies Department, Kerala and NFSA.